This may or may not be the first novel I ever read, but it certainly sticks in my mind. 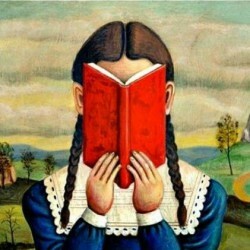 I remember reading Anne of Green Gables, The Incredible Journey, The Outsiders, all the typical childhood favorites. But at some point, probably in junior high, I decided to sneak a grown-up book from my dad's big bookshelf in the hallway, and this was the one I chose. My dad had a huge collection of westerns and Texas history books, but as an almost-teenager, it was his true crime books that held my fascination. 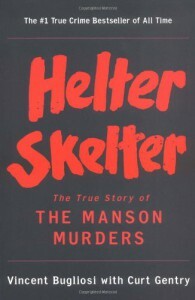 I was very curious about the creepy little man with the beady eyes and the forehead tattoo that I saw on the news every few years being denied parole for the umpteenth time, so I snuck Helter Skelter off my dad's shelf and hid it under my bed, reading it little by little at night when I was supposed to be sleeping. This book scared the bejeebus out of me then and it still scares me now. I learned my lesson, and to this day I will choose a western or a history book over true crime any day!